If you like milk chocolate, then this recipe is for you, better yet if you like cheesecake and milk chocolate then this recipe is most certainly for you. I myself am not a milk chocolate lover, however I do love a creamy slice of cheesecake. When a dish has chocolate in the title then my taste buds anticipate the rich depths of bittersweet goodness. O'Connor's Chocolate Mascarpone Cheesecake Pots fall short and only hint at chocolate, however they make up for it with their smooth silky texture. Whipping these pots up is a snap, the recipe is something like a glorified hot chocolate or a mascarpone filled ganache. Whisking sweetened mascarpone and eggs into a warm cream-chocolate base then they are gently baked till slightly jiggly in a steaming water-bath. O'Connor serves hers with these clever shortbread spoons, she uses a fun spoon-shaped cookie cutter. I of course had to dress up my own shortbread recipe with pistachios and serve the pots with cookies and crumbs, believe me I tried to make the spoons, drawing them freehand and trying to trace around teaspoons, not at all a pretty sight! So I settled for basic round pistachio shortbread and cookie crumbs. Texture: Creamy and smooth, velvet comes to mind, much more smooth than most cheesecakes I've tasted. On its own, definitely not chocolatey nor sweet enough. Although I did use an El Rey 61% chocolate instead of semi-sweet. I'm sure with a semi-sweet it's just the right sweetness. 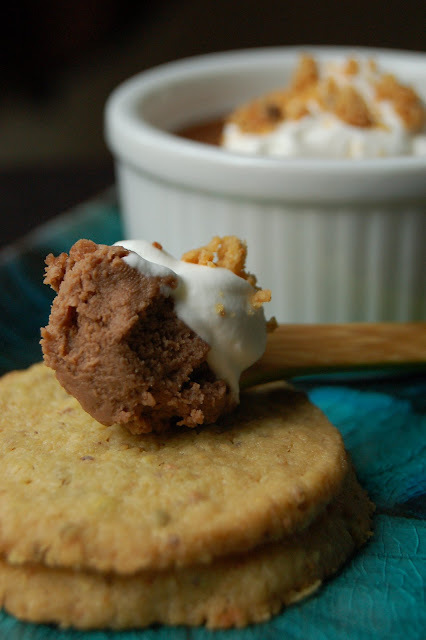 Perfect when paired with a dollop of vanilla whipped cream and cookies! The sweet butteriness of the cookies plays nicely with the creamy consistency of the cheesecake. In a saucepan, bring the cream to a simmer over medium heat. Remove the pan from the heat before the cream starts to boil and add chocolate, stirring constantly until mixture is smooth. Set aside and let cool to room temperature. In a large bowl, whisk together the mascarpone and sugar until smooth. Add the eggs one at a time, whisking well after each addition until the mixture is smooth. Add the vanilla, salt and rum (if using) and whisk to combine. Pour the cooled chocolate mixture into the mascarpone cheese mixture and whisk gently until smooth. Put eight 4-ounce custard cups, ramekins, or small ovenproof coffee cups in an empty 9-by-13-inch baking pan. Divide the chocolate-cheesecake mixture among the cups. Put the baking dish in the oven and then carefully pour boiling water into the pan, adding just enough water to reach halfway up the sides of the custard cups. Cover with aluminum foil. Bake until the tops of the cheesecakes appear solid but jiggle slightly when shaken, 30-40 minutes. The perfect consistency is a little soft, but not liquid. The cheesecake pots will firm up as they cool. Transfer the pots from the baking pan to a wire rack and let cool to room temperature. Cover each pot with plastic wrap and refrigerate for at least 4 hours or preferably overnight before serving. The cheesecake pots can be prepared up to 2 days before serving. Top each cheesecake pot with a dollop of whipped cream and a few chocolate curls and serve with a shortbread spoon. In a bowl, cream together the butter and sugar. Stir in the vanilla. Add the flour and salt and stir together until the mixture forms a soft dough. Pat the dough into a disk and wrap in plastic wrap. Refrigerate for at least 1 hour and up to 1 week. On a lightly floured work surface, roll the dough out 1/4 inch thick and cut into 4" spoons. Here she says either use a spoon-shaped cookie cutter or using a sharp paring knife cut out freehand using a small spoon like an infant sized spoon.Place the shortbread spoons on a parchment paper-lined baking sheet and refrigerate until cold and very firm, 45-60 minutes. Position a rack in the middle of the oven and preheat to 300 degrees F. Remove the shortbread spoons from the refrigerator and immediately place in the oven. Bake until the edges of the cookies are a pale, golden brown but the centers are still very pale, 25-30 minutes. Transfer the baking sheets to wire racks and let cool slightly. Using a large metal spatula, transfer the cookies from the baking sheets to the wire racks and let cool to room temperature. Store the cookies, tightly covered at room temperature, for up to 3 days, or freeze for up to 2 weeks. These little cheesecake pots are divine dollop'd onto my pistachio shortbread cookies with a spoonful of vanilla spiked whipped cream. If you'd rather try pistachio shortbread then head over to my recipes, however good luck trying to cut out the spoons freehand, the nuts have a tendency of getting in the way!